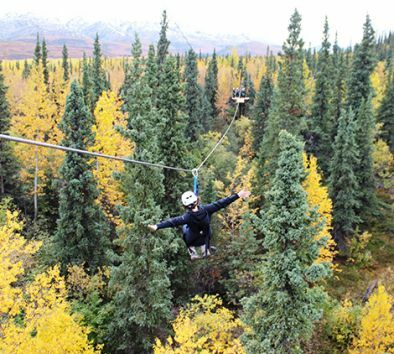 Experience life above the trees ziplining just outside of Denali National Park! Your adventure begins with a three-mile trail ride through the scenic Alaskan wilderness. After gearing up, your certified guides will lead you along six suspension bridges and eight thrilling zip lines, including the dual racer finale! The built-in, hands-free braking system allows you to relax and take in the breathtaking mountain views. Challenge yourself by traversing to the top of the boreal forest on the uniquely designed Ascending Bridge Tower. Soar through the trees and over the tundra on over half a mile of ziplines. Complete this once in a lifetime experience by racing to the finish zipping along side your friends and family! Minimum age is 8. Minimum weight is 70 lbs. Maximum weight is 280 lbs. All safety gear provided – full body harness, helmet, and gloves. Pregnant women or guests with injuries, seizure disorders, back or neck problems or hearing or vision impairments are not allowed to participate. Waiver must be signed and medical conditions disclosed. Wear closed-toe shoes, long pants and layered clothing. Dress appropriately for the weather.